Though rhubarb is technically a perennial vegetable, it’s generally considered a fruit for culinary purposes. 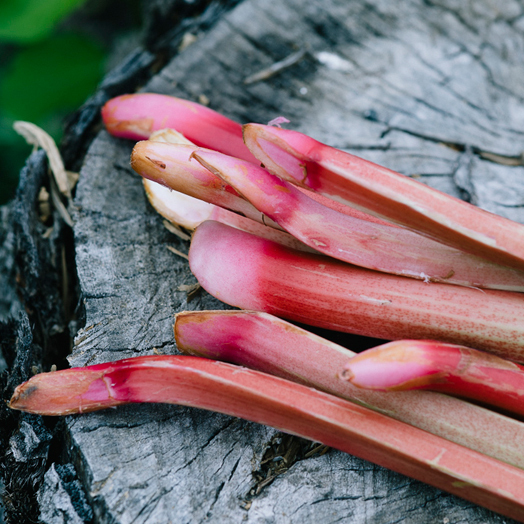 The leaves and roots of a rhubarb plant are potentially poisonous, but the red celery-like stalks have a rich and intensely tart flavor that complement sweet early summer fruits. While green rhubarb varieties are generally more productive, red rhubarb is usually more tender. Different varieties include Valentine, Crimson Cherry and Canada Red. Rhubarb leaves are potentially poisonous, but the stems are edible and full of nutrients including potassium and vitamin C.
Rhubarb stems are certainly fibrous, but they don’t contain much dietary fiber. A bunch of rhubarb can last for 2-3 weeks when refrigerated in a sealed plastic bag. We recommend trimming the ends of older stalks and placing them in a glass of water for an hour or two to help limp rhubarb stalks liven up before using them. Fresh rhubarb freezes pretty well. Chop into 1/2-inch pieces, spread on a baking sheet and freeze. Once frozen, rhubarb pieces can be slipped into a freezer bag, sealed tightly and stored for up to six months. If you have a little more time and a load of fresh strawberries, canning rhubarb is another delicious way to savor the flavor of rhubarb for many more months. Rhubarb is relatively easy to grow, but needs cool weather to thrive. The shoots are ready for harvest in the spring, and prime rhubarb season usually lasts for only a few weeks in May or June.